Chrome OS is a natural evolution of the work that’s been done on the Chrome browser, Sundar Pichai, VP of product management, and Chrome OS engineering director Matthew Papakipos said when they unveiled it at Google’s (S goog) Mountain View campus on Thursday. The operating system is designed to imbue web applications with the “full functionality of desktop applications.” As for the reasons behind the development of the new platform, they pointed to rapid growth in the netbook market — where Chrome OS is aimed — and cloud computing. With Chrome OS, Google had three goals, according to Pichai: speed, simplicity and security. “Chrome on Chrome OS will be even faster than Chrome [the existing browser],” he noted. 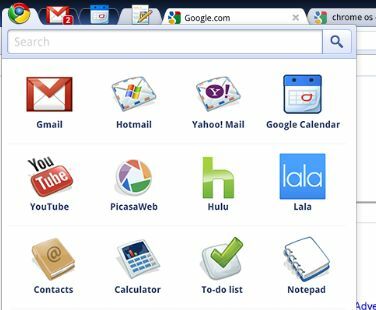 “In Chrome OS, every application is a web application. Users don’t have to install applications. All data in Chrome OS is in the cloud. If a user loses a Chrome OS machine, the user should be able to log back into the cloud and retrieve cached data.” Pichai also demonstrated that Chrome OS loads in only a few seconds. The demonstrations made clear that the OS relies heavily on “panels,” pop-up windows housing web-based applications that are similar to multiple open windows in a browser. Papakipos, meanwhile, characterized the security model in Chrome OS as very much like the one in the Chrome browser, and unlike the one in standard operating systems: If malware is detected, all cached data is saved; Chrome OS is subsequently re-downloaded, then freshly imaged on a machine. If an application crashes in a tab, only that tab goes down. The target date for delivery of Chrome OS machines is the end of next year. Google is working with hardware partners to bring Chrome OS to market, Pichai said, and doing so in unusual ways. Chrome OS is not aimed at hard disk-enabled machines, for example, but rather at systems with solid-state drives. Google is also working with hardware vendors on what Pichai described as “slightly larger netbooks,” with full-sized keyboards and large displays. All the open source code is available today, as are all the design documents, said Papakipos. You can find the source code for the OS and other links here. So does Chrome OS have a fighting chance in the hot netbook market that it’s squarely aimed at, given that it won’t make its debut on devices until late next year? Chrome OS will run on both x86 and ARM processors, which as jkOnTheRun has noted, will give it a broad spectrum of coverage on devices, and could make it a significant player in the emerging ARM-based smartbook hardware category. Still, the OS will significantly trail the arrival of Microsoft’s Windows 7, which is also squarely aimed at netbooks. Could Google subsidize Chrome OS-based netbooks in an effort to attract users with low prices and feed them into its search-and-advertising ecosysytem? As is true for most of Google’s projects, feeding that lucrative ecosystem tends to be a high priority for the company. It will no doubt be one as Chrome OS makes its way into devices next year. I love it! All your data are belong to Google. Without a connection to Google, your “Chrome OS” computer is useless. And Google can mine your data for personal information and develop an even BETTER dossier on you than it could from just reading your GMail e-mail! It will quickly get your home address, your business address, your phone numbers from the letters you write; your credit card numbers from your online transactions (especially if you use Google Checkout); your SSN from the documents you exchange with government agencies. Gullible users will deliver all of their personal details right into the hands of Big Brother GoogleClick. Wouldn’t touch it with a hundred foot pole. The browser based model very limiting and we need to reinvent the wheel for many apps and everything and train users and developers for different technologies. What is wrong with iPhone model where app delivery/update is as simple as using a browser but usage experience is like Desktop. lal my comment is deleted… CHROM IS NOT GOOD!!! Maybe Google can make Linux more popular than now. They target first their most important markets. i luv everything about Google Chrome except its target is netbooks….they shud foucus on desktops first..
Can it finally happen? Will someone other than Apple be able to make inroads on the OS market where Linux failed? If anyone can match Redmond’s ability to throw dollars at a problem, it’s Google. Here’s hoping they succeed, although Windows 7 is a surprisingly good product all things considered.